A participant in research into HIV infections is tested for the virus (file photo). 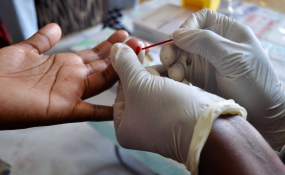 Eight neighbouring countries, known as Elimination 8, from Southern Africa yesterday signed a US$14,2 million grant from the Global Fund to Fight AIDS, Tuberculosis and Malaria meant to sustain efforts towards eliminating malaria in the region. Represented by Zimbabwe as the chair, the E8 countries which also include Angola, Botswana, Eswatini, Mozambique, Namibia, South Africa and Zambia are expected to focus on activities that are catalytic, regional in nature and structured to give high impact. These activities, a majority of which started in 2015 when the E8 block was mooted, include malaria epidemic preparedness and response, vector control capacity building, indoor residual spraying and supply of bed nets and conducting regional coordinating meetings. Speaking at the signing ceremony, E8 Ministerial chairperson, who is also Zimbabwe's Health and Child Care Minister, Dr Obadiah Moyo, said these areas of focus will go a long way in eliminating malaria in the region. Dr Moyo said the first round of the grant focused on eliminating malaria in hard-to-reach populations, particularly those along the border districts, mobile and migrant groups. "A total of 33 health posts were constructed and 13 surveillance units were set up across the eight member states. "The grant also funded human resources and supported capacity building for case management, epidemic preparedness and response among other activities," said Dr Moyo. Global Fund Head of Grant management Mr Mark Edington said the E8 initiative was a great example of collaboration between countries. He commended the E8 bloc for collaborating with the rest of SADC, involvement of permanent secretaries around the region and streamlining of activities.